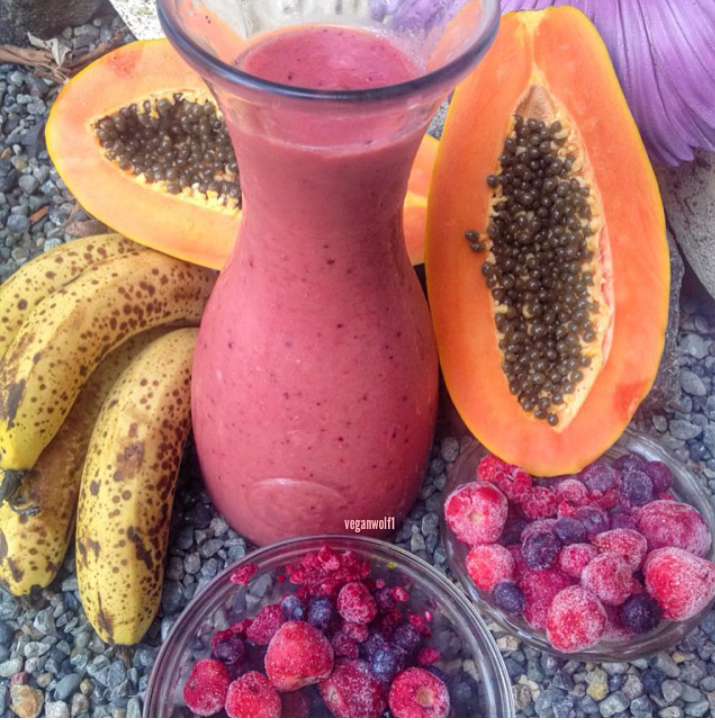 Hey, today we'll try a simple papaya smoothie recipe. Do you remember how old you were when you first had papaya? I was about 15 when I had my first hit :-). I really loved the texture of this fruit and how juicy it was, especially when it is cold. Sadly though, papaya isn't grown in huge numbers like other fruits here in Jamaica so to my family and I it was a luxurious fruit to be savoured only a few times each year. Since then, papaya has become one of my favourite treats (yeah, I like to treat myself) and I have learnt so many interesting facts about it that I just had to share with all of you. It's vegan... haha well that's not really surprising since all fruits are but I thought I would put it out there.. this is my kinda fast food. Papaya isn't really a tree but rather a really huge herb( it can grow up up to 33 feet). Papaya is great source of vitamins C and B vitamins. It contains beta-carotene which turns into vitamin A inside the human body and tonnes of cool minerals plus a high dietary fibre content. One serving of papaya can provide you with all the vitamin C you need for a day. This wonder fruit can be used to treat malaria, dengue and digestive problems. Ropes are made from its stem and bark. Papaya is a good source of lycopene, a cancer fighting agent. Christopher Columbus referred to papaya as the fruit of the gods. Papaya is known as Paw Paw in countries like Australia and south Africa. Lastly papaya is actually classified as a berry. Well that's my top 10 but there are many more super, awesome, fun facts about papaya that you can read here. Now on to our smoothie huh? We won't need much for this recipe. Peel the papaya and remove the seeds. Add to a blender and blend while gradually adding the frozen bananas. That's it, when you're done blending you should have a thick, rich, creamy smoothie, one of the fine delights in life. If you are not going to use frozen bananas then you can just add everything to the blender at the same time along with a few ice cubes and get blend away. Don't add too many ice cubes though, we wouldn't want to dilute the flavour, or as Jamaicans would say, "water it down". If you have a sweet tooth you can add some watermelon to the mix and while you're at it, try this watermelon smoothie. Note: papaya seeds can be eaten and are pretty spicy and peppery. I often use the seeds in a few meals instead of black pepper. Have a blast with this papaya smoothie recipe before you head out in the mornings and you'll be glowing all day.